The boys and dad made a special machine, we celebrated Thomas being 4 (a bit early) and There Will Be Potatoes. Stay tuned. From the Ferry. WaMu to the left, highrise tall building. The New Seattleites at dinner before we left. Its been a while but I just thought I'd make a quick post and let everyone know that we're alive and well in Houston. 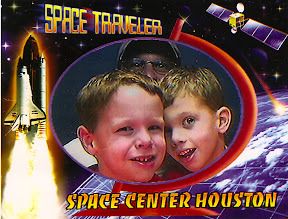 We spent the day at Space Center Houston (4th time this year) and as usual the boys had a great time. We actually got to take the tram tour and see Mission Control and then training facilities. 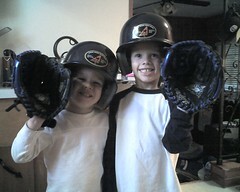 Charles and Thomas seemed to enjoy it, but as usual the most fun was had on the playground and the activity center.